This biopic is an excellent watch that will pull on every last heart string you posses. Enter a pre-World War II America to watch a young J.D. Salinger on his insatiable quest to become a published writer for The New Yorker. The role of Salinger is played by British actor Nicholas Hoult, who absolutely immerses himself into the character of Salinger. His sarcastic, witty and cynical tone all blend nicely together to produce a very layered Salinger. His love interest, Oona O’Neil, played by American actress Zoey Deutch, adds an intoxicating dose of sexual tension and drama to the film. Oona’s character helps to show a softer side of Salinger, who is starstruck by the young beauty. The next and perhaps best character besides Salinger is Professor Whit Burnett, played by House of Cards star Kevin Spacey. Spacey delivers a brilliant performance as Salinger’s creative writing teacher at the University of Columbia. Hoult and Spacey are great on screen together. Their chemistry is excellent, supplying intellectual sparring and heartfelt conversation. Burnett is shown as the father Salinger always wanted. This film shows Salinger as a man who always seems to be on the outside looking in. Each life experience he goes through provides the fodder for his next short story. And because he uses real life scenarios his stories have very cynical endings. Showcasing this is where the film shines, it does a masterful job of showing the audience Salinger’s process. It attempts to get inside his mind and help show how he came to write such gritty yet realistic stories. The war, for instance, shows the mental and physical pain Salinger endured. The war almost costs Salinger his sanity, but rather than allow himself to be destroyed by his demons, he returns to writing and pours out his pain through the pen and onto the paper. This movie is phenomenal because it seemed to present a realistic view of who Salinger was. Rather than praise him for being a really great writer, “Rebel in the Rye’ helps to make him human. Often, great writers are immortalized and seen as being beyond scrutiny. But in this film, Salinger’s personal struggles and character flaws are put on full display. 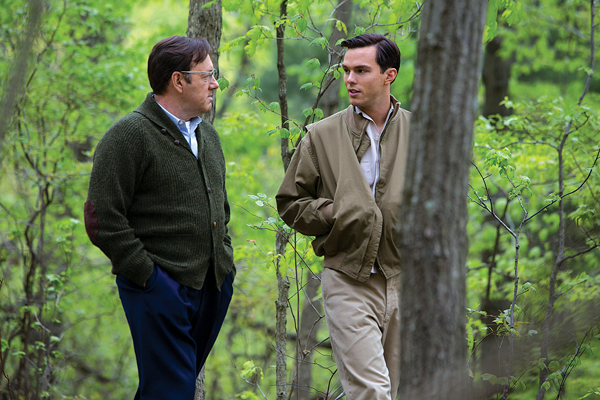 The actors convey each part of Salinger’s story beautifully, and Hoult, I believe, pays a great homage to Salinger. “Rebel in the Rye” is a must see film for all aspiring writers.